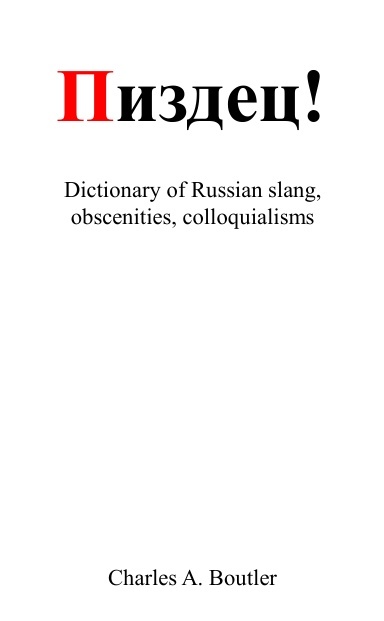 The following 1,700 words and expressions are rude, naughty and generally not something you would say in front of your mother (this is an alternative Russian slang dictionary, after all). The core is obscene Russian slang, or мат, which is often judged not to be printable (нецензурные выражения) even though it merely relies on three to five words and their many derivations. Furthermore, as the educated Russians got an extensive opportunity to mingle with criminals under the Soviet regime (especially in the various gulags) many terms from the thieves’ cant (феня, блатная музыка) spread throughout the whole Russian society and should be understood. Others are mere colloquialisms but also fail to appear in standard Russian dictionaries, the newest section concerns modern Russian Internet slang (do not miss the new krivetizator, a tool turning proper Russian into something a geek can read). This site is dedicated to making the commonly spoken Russian language, curses, slurs and profanity more understandable for non Russians, but you should better not use them. Trust me. Or read paragraph 13.21 and 20.1 of the administrative law infringement of the Russian Federation. I shall not be held responsible for any injury that you might well suffer if you chose to utter those words in public (my thoughts go to the bereaved relatives). Explanations are often given in standard language, some with British slang equivalents, but you still might not be able to assess the rudeness of the words properly. The spelling, especially of unaccentuated vowels, is often a source of discussion, I may be wrong sometimes. If you spot mistakes or know more interesting words please mail me! You might get a spot on the hall of fame / Доска Почёта. This work may not be copied without prior agreement. © Ch. A. Boutler 1997-2017. Are you looking for an astoundingly surprising gift? as a paperback for a bargain! Cheap! Russian word (grammatical type) [ISO-9 transcription + accent] (slang type): Translation, explication, examples. Abbreviations: f – feminine, m – masculine, n – neuter, adj – adjective, adv – adverb, v – verb, pf – perfective, ipf – imperfective, \o/ – Internet slang, блат – criminal slang, мат – obscene slang, нарк – drug slang. You may want to start with one of the main words of Russian мат (obscene slang): Блядь, ебать, пизда, хуй (terms deriving from differents roots are not considered to be мат, merely colloquial, cant or slang), a random word or click on the letters at the top of the page. Вы знаете слово, которое отсутствует в словаре? Пишите пожалуйста сюда! В этом словаре объясняются русский мат и сленг на приличном английском языке (короче: здесь мало английского сленга, американского совсем немного). Попиздеть с автором можно также в ЖЖ. Download a free pdf-preview of the dictionary here!